The modern education system, one way or another, aims to form students' abilities to work with information. It is no coincidence that the prior areas of education development pay special attention to form skills of information processing, which later becomes the mainstay of professional activity of graduates in the information society, a necessary component of information culture. In such circumstances, students will acquire the necessary knowledge to express themselves creatively, learn to evaluate the accuracy of the information, develop critical thinking, and distinguish information and knowledge. Local networks are common in the education field. Most schools and other educational institutions have computers connected to a local network. At the same time, modern technologies allow to connect even the computers that are on different continents, and not only in the same room or building. Numerous educational institutions have branches in different countries, with computer connected via local network. Moreover, local area networks can connect computers from different colleges or universities. Using Internet, any student can get public access to education materials that can be presented in the form of simple textbooks (e-text), as well as in the form of complex interactive systems, computer models of virtual learning environments, etc. The number of users and information sources of Internet is continuously increasing. In addition, there is a constant quality of telecommunications services improvement. Because of this, not only companies and organizations operating in the economic and other fields have a high-quality access to the Internet, but also educational institutions. Many systems are susceptible to vulnerabilities that can take full control of critical resources (e-mail systems, network equipment management and others). Critical vulnerabilities are often associated with the use of outdated versions of software and operating systems. Studies have shown that the modern corporate networks are quite vulnerable to attacks from internal and external intruders. The ability to access the critical resources of most examined systems leads to the conclusion about the necessity of the information security measures improvement, particularly in the area of password policies, web application protection, providing regular security updates and protection of privileged accounts. For safety deficiencies early detection, system administrator should regularly conduct security analysis, including the form of penetration testing. 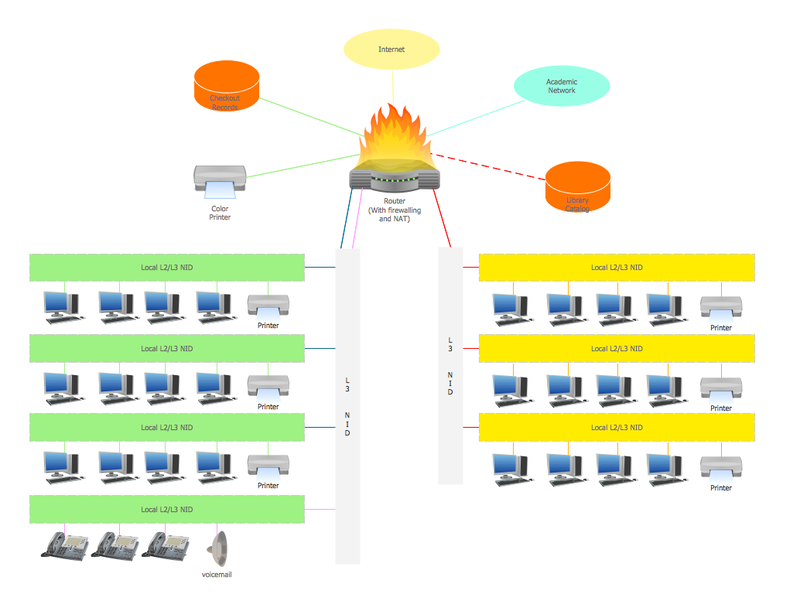 A Campus Area Network (CAN) is a computer network that links the buildings and consists of two or more local area networks (LANs) within the limited geographical area. It can be the college campus, enterprise campus, office buildings, military base, industrial complex. CAN is one of the type of MAN (Metropolitan Area Network) on the area smaller than MAN. 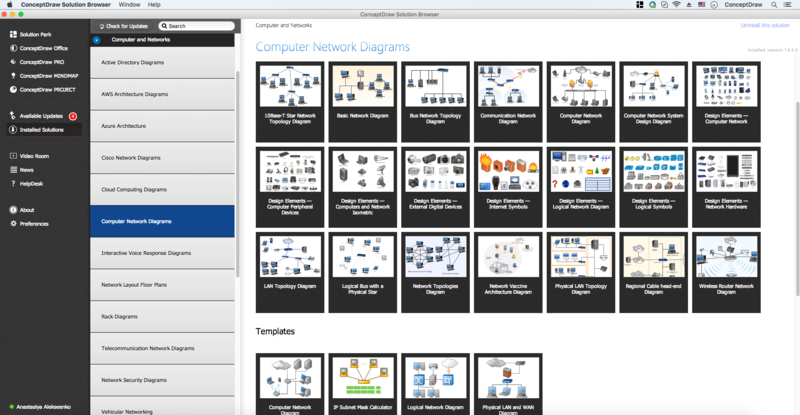 ConceptDraw DIAGRAM is a powerful diagramming and vector drawing software that allows quick and easy draw the Campus Area Networks. All these allow you create the Campus Area Network of any complexity in a few minutes. Example 3. Campus Area Network (CAN). This example was created in ConceptDraw DIAGRAM using the Computer and Networks Area of ConceptDraw Solution Park and shows the Campus Area Network. Campus network can be additional to the set of wireless connections, connect several buildings to the same network, but it's not the same thing. A campus network should be broad enough to cover a large territory, while the point-to-point access simply distributes a separate network within the territory of several buildings. Project Athena at MIT and Stanford University Network at Stanford University are the most well-known networks. Athena was launched in 1983 and it still works. It’s primary purpose was to share experience, code and ideas among students, to found a base of knowledge for the future generations and to develop educational tools. This project influenced the development of instant messaging, online help systems, improved client–server model of distributed computing, developed Kerberos protocol for encrypted authentication and authorization and has many other functional and system management advantages. Some of Athena architecture design features are used beyond MIT, for example in Iowa State University and North Carolina State University. All networks designed with ConceptDraw DIAGRAM are vector graphic documents and are available for reviewing, modifying, and converting to a variety of formats (image, HTML, PDF, MS PowerPoint, Adobe Flash or MS Visio).